This set of three Crystal Ball earrings includes a decorative box. The set contains one each of 6mm Crystal Ball, 6mm Violet crystal Ball, and our 6mm Alexandrite Crystal Ball. 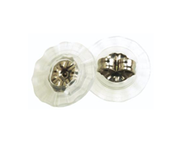 All are set in our super safe medical grade titanium. Backs are always included. The three styles are shown below. Separately these would sell for $150, making the Gift Set a great value at just $115! While supplies last. No substitutions please.